Jurek Becker, the author of the first comic novel on the Holocaust, Jacob the Liar, and other highly acclaimed works, was one of West Germany’s most famous exiles from the GDR. A survivor of the Shoah-his mother died in a Nazi death camp-and witness to the Soviet occupation of Eastern Europe, Becker endured most of the trials that Jews experienced in Europe from the onset of World War II to the end of the Cold War. In the first biography of this fascinating figure, Sander Gilman tells the story of Becker’s life in five worlds: the Polish-Jewish middle-class neighborhood where Becker was born; the Warsaw ghetto and the concentration camps where Becker spent his childhood; the socialist order of the GDR, which Becker idealized, resisted, and finally was forced to leave; the isolated world of West Berlin, where he settled down to continue his writing; and the new, reunified Germany, for which Becker served as both conscience and inspiration. Gilman was close friends with Becker for nearly thirty years, and his biography is based on unprecedented access to both the man and his papers. As Gilman reveals, Becker’s story encapsulates the fractured experience of life in twentieth-century Europe, a time and place in which political systems and national borders were constantly in flux. The life of Becker, we learn, was one of great literary achievement and notoriety, but it was also one of profound cultural dislocation. An important theme in the book is Becker’s struggle with his Jewishness, an identity he repressed in socialist East Germany, but embraced after reunification, when he found himself at the center of Jewish culture and literature. 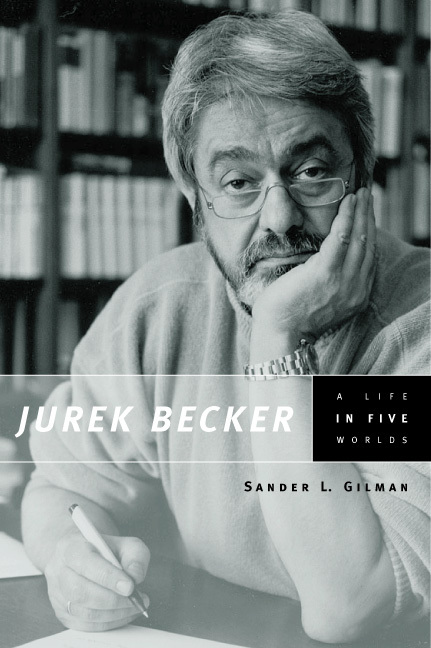 Sander Gilman’s story of Jurek Becker is biography of the highest order, a portrait of an extraordinarily gifted artist whose hope and courage are manifested in his legacy as one of the greatest German writers of the past century. "Becker, writing simply and clearly in an unstrained narrative, speaks with the voice of knowledge, and we do well to listen to him." "Jurek Becker was one of the most appealing and adventurous writers to emerge from the former German Democratic Republic. He possessed a rare gift for approaching serious subjects through comedy, and he applied it to some of the most challenging episodes of modern German history, from Nazism and the Holocaust, through everyday life in East Germany under communism, to the drama of reunification." "This eminently readable book provides a wealth of fascinating new information, particularly about Becker’s relationship to his Jewishness. Beginers and experts alike will thoroughly enjoy Gilman’s exceptional scholarship." "This good biography supplies much to ponder." "In what is a testimony of friendship as well as a solid scholarly work, Gilman traces Becker’s multi-faceted life through several ’worlds’ and identities. . . . It’s a life so labyrinthine that it’s almost emplematic of the twists and turns of German history in the last decades." "A touchingly intimate portrait of the man and author. . . . This book is a pleasure to read from start to finish."